Alleged Fraud And Corruption In Holder’s Justice Department: Why Isn’t This Considered News? 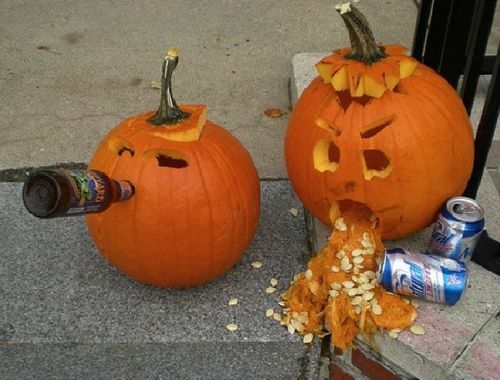 A drunken pumpkin riot! Now THAT’S News! 1. Because everyone already knows that the Justice Department is corrupt and Eric Holder is an incompetent political hack. 2. There was a huge pumpkin festival riot in Keane, New Hampshire! 3. The news media is so biased that it will even treat an astounding judicial ruling as a made-up “conservative media” story. 4. It’s just more evidence of how abysmally the Obama administration is being run, and an election is coming up. 5. The world has gone mad. I think any of them are plausible explanations. Whichever it is, I guess I am honored to be able to help break some news, as it is not usually an Ethics Alarms function. This story has made it to exactly one news source as I write this, the New York Observor, though a few conservative blogs are noting it. Read the story itself and the links here. Two former Assistant United States Attorneys say Holder ‘s Justice Department engaged in deceit and corruption in pursuing its litigation against Sierra Pacific Industries, a California lumber company. Responding to the allegations—and remember that false allegations of this magnitude would mean the end of these lawyers legal careers– Federal District Judge Morrison C. England Jr. has ordered the recusal of every federal judge in the Eastern District of California, on the theory that since the court may have been defrauded by the government, an outside judge is needed to handle the matter to avoid a conflict of interest. This week, Eric Holder will award Shelledy the Department’s highest award for excellence, because in the Justice Department of Eric Holder and Barack Obama, this is what excellence has come to mean. But who cares about the systemic political corruption of the nation’s Justice Department when there’s a pumpkin riot to talk about? John, in my opinion, ALL of the governments actions for the past 22 years are worth reviewing. Clinton’s administration set the bar at a new low for government and elected officials. I’m only surprised that it has taken as long as it has for the corruption to get this bad. I am not any sort of surprised that the sold-out, in-the-tank media is not reporting it. So, if Sierra Pacific wins, what would be ‘justice’? I think they should be paid the same judgement they were saddled with, $55 million and 22,500 acres of government land. I assume the government got to pick the acres they wanted. I think Sierra Pacific should be allowed to as well. Washington D.C., perhaps? There’s a reason they call it Foggy Bottom. Oh no, another government immunity dilemma. Glad I banned Art. Of course, there is usually no compensation for “mistaken” government (malicious) prosecution, just a big sorry, and maybe some rough times for those responsible. There are exceptions, however—I’m not up on the law enough to know how these come about. Would the Ruby Ridge $4 mil payout be another example? At least most government officials only get qualified immunity. If they exceed or misuse their authority such that a reasonable person in their position would have known better, they lose immunity. I dislike absolute judicial immunity largely because it is absolute. It’s not getting reported because destroying private industry is part of the Left’s mantra. The media is a component of the Left. Why would they report negatively or report on something that portrays negatively on the “utopia” they too wish to see? Fox News has missed it. The Washington Times. ??? The obvious answer to Jack’s question is “all of the above”. That includes the last option. Insanity is just as infectious as Ebola when introduced into a restricted populated area.